Our policy briefings and reports focus on the issues around accessible housing and inclusive design. Our research reports deliver in-depth analysis on issues such as the impact of adaptations, housing need, welfare reform, and the allocation of properties designed specifically for wheelchair users. In 2018 Habinteg assessed accessible housing requirements in place in local planning authorities across England. 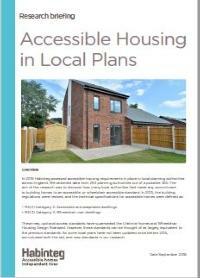 The research was collated and recorded by looking at the accessibility requirements in local plans across 263 out of a possible 365 local planning authorities across England. The research shows how many local planning authorities across England mention accessible housing, but more importantly how many have committed to providing a proportion of accessible housing within their local plans. This briefing outlines the current UK housing policy landscape for accessible housing and provides recommendations for a more inclusive future. It also highlights the significant accessible housing deficit, seeks to inform and update housing professionals about policy developments that may affect them, and makes the case for including accessibility amongst their top priorities. This research report by Habinteg and Papworth Trust highlights the hidden housing market for 1.8m disabled people. The new findings clearly show the demand for accessible housing to rent and buy. Conducted by teams at the London School of Economics (LSE) and Ipsos Mori, this research uncovers a fresh view that challenges assumptions about the potential for disabled people to buy their own home. The report also sheds light on the wider appeal of homes that deliver higher quality accessible features. This briefing paper from Habinteg compares the technical specification provided in the 2015 Building Regulations M4 (2), ‘accessible, adaptable dwellings’ with the sixteen design criteria set out in its predecessor, the Lifetime Homes Standard (2011). The briefing was first published in November 2015, and the updated second edition was issued in June 2016. Habinteg took part in delivering the European Federation for Living’s (EFL) new competition to explore what accessible housing will look like in the future. Architecture students from across Europe submitted innovative and creative designs for a new generation of accessible homes that could help older and disabled people live more independently.